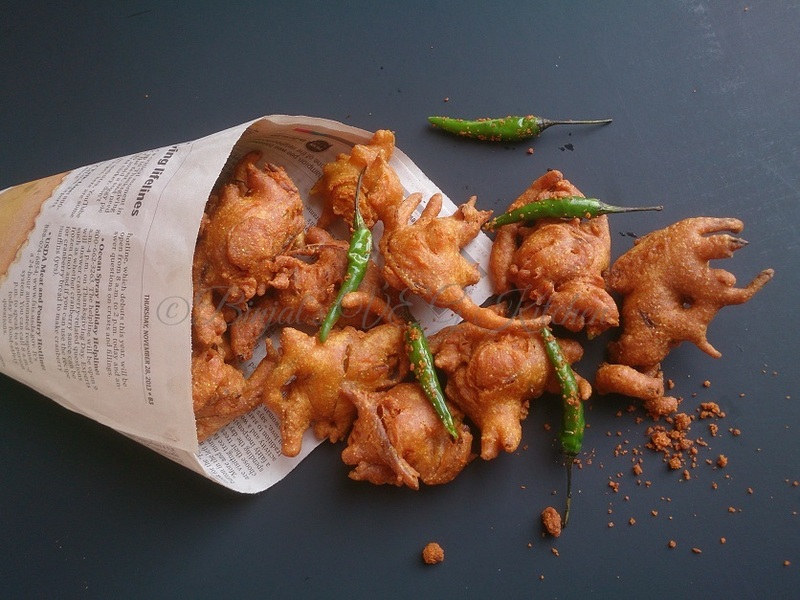 Onion Pakoda is one of the very famous Mumbai street food. Onion Pakoda is very crispy and delicious. Onion Pakoda is also called Kanda Bhaji in Mumbai. 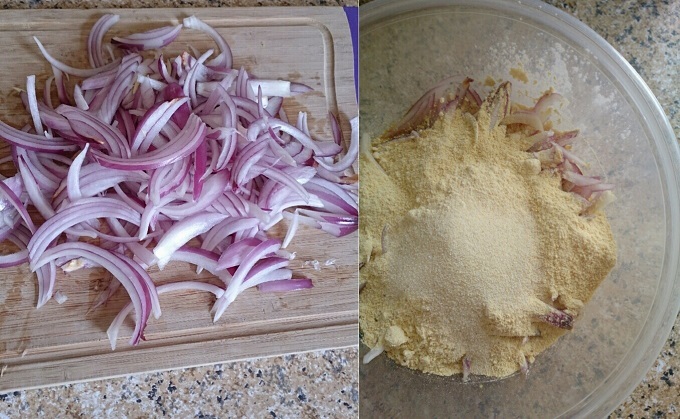 Onion Pakoda is perfect for breakfast or snack during winter or rainy season. It’s one of my favorite Mumbai snack, I miss this in USA’s cold weather, so I made this on my weekend breakfast menu, me and my family enjoyed a lot. It can be made in less than 30 minutes. It’s perfect for children when they are hungry and want some crunchy meal. It made with sliced onion, besan, spices and proper water consistency is a key of perfect crispy onion fritter. 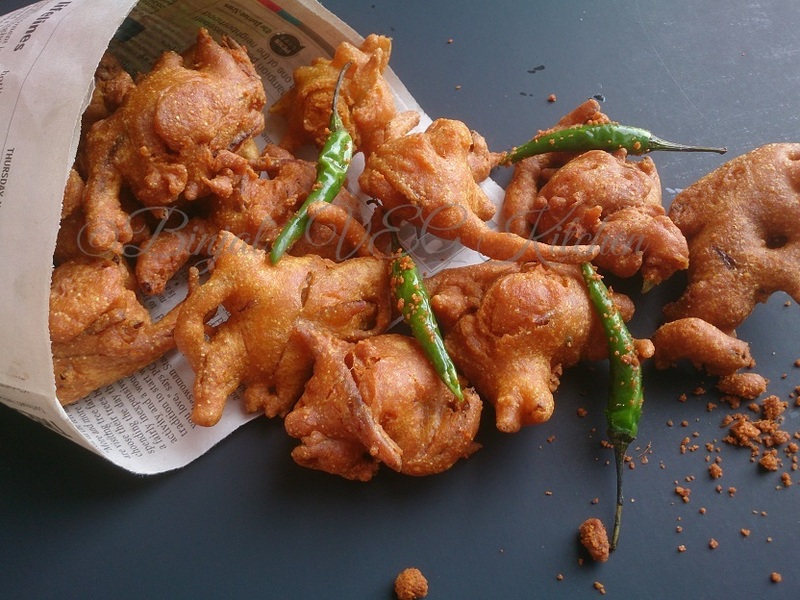 Many people add soda in Onion Bhaji batter, it makes Pakodas soft and fluffy. Onion Bhaji soaks lots of oil when you add soda in it. 1. Take a large bowl, add thinly sliced onion, chopped Green chili, besan, and suji. 2. Add Red Chili powder, turmeric powder, salt, sugar, water as required and mix well, make a thick batter, keep aside. 3. Now heat the oil in deep pan on medium to high flame. Drop spoonful of the onion mixture using your fingers and then deep-fry till they turn into golden brown in color from all the sides. 4. Repeat with the remaining batter to make more Pakodas. Drain on absorbent paper and keep aside. 5. Serve Onion Pakoda with fried green chili and dry garlic chutney. 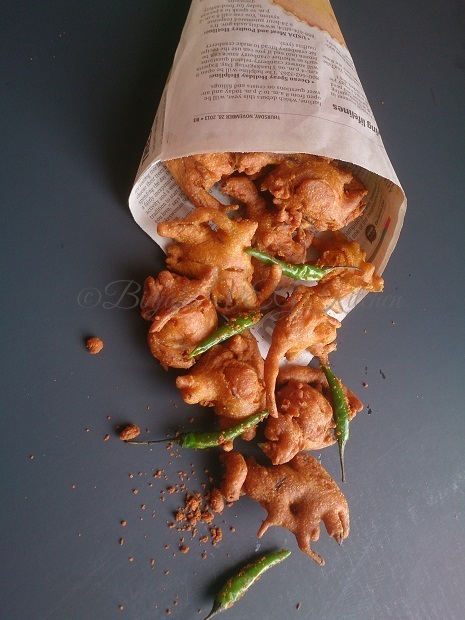 Onion Pakoda is one of the very famous Mumbai street food. 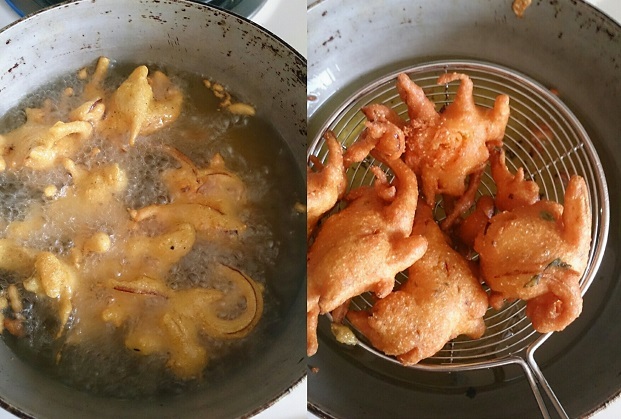 Onion Pakoda is very crispy and delicious. Onion Pakoda is also called Kanda Bhaji in Mumbai. It is perfect for breakfast or snack during winter or rainy season. Take a large bowl, add thinly sliced onion, chopped Green chili, besan, and suji. 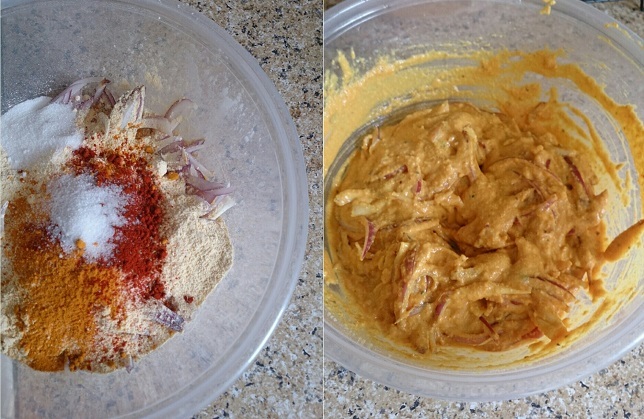 Add Red Chili powder, turmeric powder, salt, sugar, water as required and mix well, make a thick batter, keep aside. Now heat the oil in deep pan on medium to high flame. Drop spoonful of the onion mixture using your fingers and then deep-fry till they turn into golden brown in color from all the sides. Repeat with the remaining batter to make more Pakodas. Drain on absorbent paper and keep aside. Serve Onion Pakoda with fried green chili and dry garlic chutney.